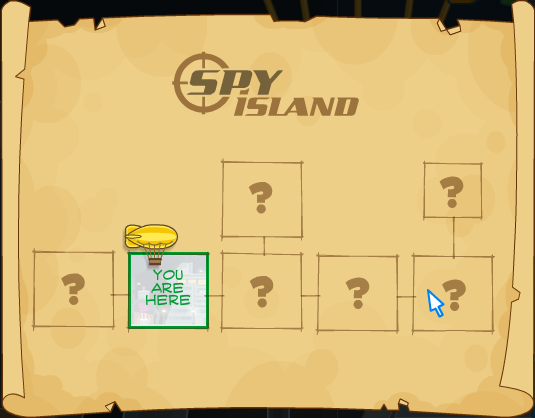 The secret forces of Spy Island have discovered a new enemy -- the B.A.D. (Bald And Dangerous) organization, which is plotting to make everyone on Poptropica completely bald! It's up to you (again) to become a spy agent looking for your missing fellow spies, and find out someone very close to you is betraying the whole group on the way. Spy Island is guaranteed to be a hair-raising adventure! Before we start we'll have to speak with the Director of Secret Operations. Don't get too excited, run into the Headquarters building to your right and talk to Director D, on the very top floor. He will clue you in on the news of B.A.D and the missing agents, and give you a message decoder, to make sense of secret messages. Then he will turn you into an agent. Leave the building and run right into the Bistro, at Balding Avenue. To get a job, talk to the chef in the kitchen at the right. If you win the memory game (which is different for everyone), he will give you the job. I suggest bringing up a text editor window to make it easier. Put on the hat after you have the job so the big B.A.D. will trust you. He will ask you to fill up his wine glass, which has his fingerprint on it. You can't race out the door with it. So take it into the kitchen and hop onto the refrigerator. Jump off onto the shelves and then the vent. Climb through it, and then go across the light fixtures to exit. This will take crossing only about three lights. Run to the Spyglass Eyewear store back on Main Street and talk to the doctor. He seems a bit evasive while talking about the secret room that's obviously up there, but he'll let you take an eye exam. Instead of doing it correctly, do them in the opposite (up instead of down, left instead of right and vice-versa.) This will prove that you are a trusted agent (although to me it only proves that your eyesight is most definitely not appropriate for an elite secret agent...but I digress). After you have done this he will leave, after closing the store. Exit and climb up to the top floor (from the outside of the building.) Do the obvious thing with the door and Dr. Spyglass will give you the Chameleon Suit, which you can use at the Docks to escape the guards. Meet me there with your suit on. The hiding agent there will tell you where the first agent is being held under custody. "On the Roof", but we knew that already. What you gotta do here is climb up to the roof and avoiding the guards. You can do this by starting at the ramp to your left. There's a lot of these as you get higher. The Chameleon Suit will make you completely invisible to B.A.D. while you aren't moving. Once you're at the roof, go to the left edge and jump off left, hard. You should land on the correct building. Go into the small room there. Now there are three levels you have to beat. You need to reach the bottom while avoiding the dogs as well. This isn't so hard. Just remember to tag behind them only when they're not facing you, then freeze when they change direction. After that, you can run the rest of the level. Be careful on the lower levels; if the dogs get you, you'll be launched to one of the upper levels. Then, make your way to the top left of this room on the platforms by jumping, and go into the small storage room at the very left through the ceiling of it. Click on the agent and he will give you part of B.A.D. 's secret and the Laser Pen. He'll also knock out the guard there you you can leave the easy way, through the door. Run right to Toupee Terrace, and collect the message from the other agent on the way. Graffiti on another building will tell you how to read it, the first line, top-to-bottom. Uh-oh. Suddenly I have a bad feeling about Director D.
Your job now is to climb the scary building with the lasers clearing the windows and doors. It's not so hard; you just have to time your jumps. Climbing the first one is easy. You can use the ledges to rest for as long as you want, then jump when the window is clear. The groups of tall windows are easy because they activate/deactivate in a wave pattern. The next building has no breaks. At the top use the Laser Pen to melt the bars to the attic. Inside you can rescue the second agent, and get the awesome Grappling Bowtie. This is really helpful but of course there's a catch: it only works on Spy. Run left to Balding Avenue. The grappling bowtie works either when you click its icon in the lower left, or when you click anywhere while you're not on the ground. A hook will fly in that direction, and the next time you jump, you will be pulled toward the target. Be careful, it can get extremely tricky to control! Run left and climb the red building by normal jumping. now aim to the right, with the arrow horizontal with the platform you're on. You'll be on a gray roof. aim horizontally to the right and land on the windowsill. climb up to the Rooftops of Balding Avenue. This part is a bit tough. Grapple left, at a 30 degree angle. If you're good, you'll hit a hut on another roof but not the platform with the B.A.D. agent. If you do, swing out anyway but shoot to the left with the bowtie before you fall all the way. From the rooftop, climb the antenna, then grapple to the other antenna to the right (at a 30 degree angle... 30 seems to be the magic number here). Make sure to take off the tie before you go into the Greenhouse, through the vent. There are some vicious plants in here, so watch out. There's also an agent on the top floor that we have to rescue. Run right and click on the cherry bomb to drop it. You now have 40 seconds until it blows. if you're on the moving platform, you're doing fine; otherwise jump to it. jump up, walk right, and use the glass from the Bistro to unlock the door and go in. Only five steps. Easy as pie. Run right and climb up the structure. Make sure not to jump too high, to avoid the low lasers. Click on the computers and you will be trapped! Wait, here comes Director D. What's he doing here? He'll free you. Click on the computer again. Type "LASER[enter]HAIR[enter]REMOVAL" (obviously, don't type [enter] but press the ENTER button) at the terminal to get your uplink to the satellite. Uh-oh! Looks like the Director is no longer on our side. Now, grapple up. There's another orb there. Now, grapple horizontally to the right. Another orb there. They will touch the orbs and explode. These are easy, but the next part is easier. Director D will come at you with his transporter ship with a pathetic laser on the bottom. Oh, horror. Good thing there's virtually no gravity! Jump on top of his ship and the numskull will keep trying to fly up to you. Instead, he will hit the roof and crack his control room. (Don't worry if he zaps your hair, this is temporary). Do this three more times and he gives up. Later in the Headquarters, you will be declared Director and awarded the island medallion by the secretary. You can also see D locked up near the top left. Hooray! 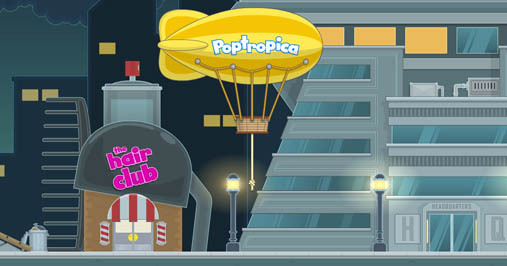 You saved Poptropica from complete baldness!